(Bloomberg) -- The Hong Kong dollar jumped the most since December on Wednesday, as short-sellers were burned by spiking borrowing costs. 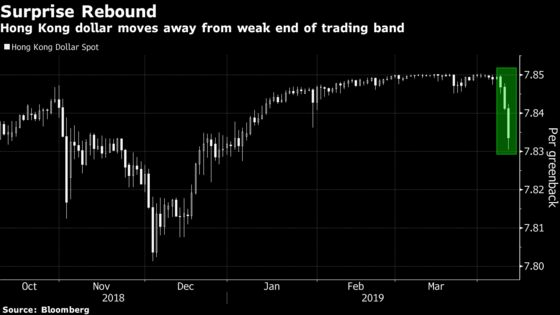 A gap between borrowing costs in the city and the U.S. fueled weakness in the Hong Kong dollar in March, as traders sold the local currency and put the proceeds in the higher-yielding greenback. 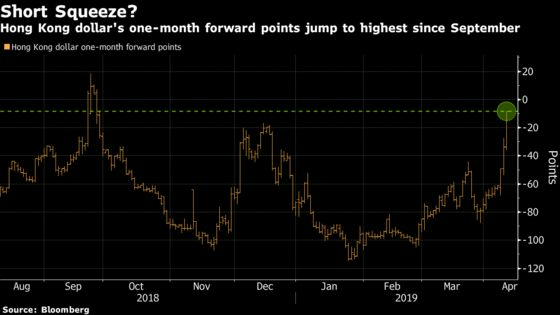 That spread has narrowed, partly thanks to intervention, from almost 1.6 percentage points in February to 43 basis points -- making shorting the Hong Kong currency a less lucrative trade. Gains in local equities this year could also be contributing to the advance, as investors purchase the city’s currency to chase the rally, according to Ryan Lam, head of research at Shanghai Commercial Bank Ltd. The Hang Seng Index closed at the highest since June on Tuesday, before slipping 0.1 percent Wednesday.